4K and Ultra HD are two interchangeable terminals that are often heard today and seen on the labels and lists of the specifications of televisions and monitors, and among the majority of acronyms, specifications and different standards, it is difficult to assess whether it is a significant change from the old standard, a new issue or an upcoming standard. If we compare the Full HD and 4K Ultra HD screen of the same size, the number of pixels is more densely thicker, which, together with the fact that 4K Ultra HD content rotates at 30 frames per minute, makes the image much more natural, color deeper and contrasts sharper. Compared to Full HD, 4K resolution has four times more pixels. This also means that a much larger amount of detail can be displayed on such a screen. The image displayed in the UHD resolution looks remarkably, with incomparably more detail than Full HD. If we take a closer look, the Ultra HD 4K does not have 4000 or more pixels in one line, but 3840, and the same thing is with Full HD that does not have more than 2000 pixels in one line, but 1920. It’s because the nomenclature “the number k” takes the formats of work of professionals, cinema distributions, studios, etc., but with the arrival of Ultra HD, this term began to be used among consumers. When we go to a movie that has a “2K” resolution, we see a movie that is 2048 pixels in 1080 lines, and in the case of “4K” projection, it is a resolution of 4096 x 2160 pixels. These resolutions are defined by the Digital Cinema Initiative, which was created in collaboration with the leading film studios. Ultra HD is a video format proposed by the Japanese public television network NHK and defined and approved by the International Telecommunication Union (ITU). On October 17, 2012, the Consumer Electronics Association (CEA) officially announced that the term “Ultra HD” will be used on all screens that have a 16 × 9 image format and at least one digital connection that can send a resolution of a minimum of 3840 × 2160 pixels. When it comes to UHD, first of all we think about the image resolution that is bigger than the one we know under the name Full HD. Full HD stands for a picture that has 1920 pixels set in 1080 lines, which we find today on all TVs from lower-middle class to high class. Ultra HD implies twice the number of pixels and lines in its basic version, which can also be called Quad Full HD, as it has four times more pixels than a Full HD display. All UHD televisions that have appeared on the market since 2012 to date have an UHD resolution of 3840 pixels in 2160 lines, which in other words means that they have 4 times more pixels than Full HD televisions. Given that there are two Ultra HD resolutions, 3840 x 2160 and 7680 x 4320, for easier identification, the first name is Ultra HD 4K, and the latter is Ultra HD 8K. 4K presents cinema standard and professional production, while UHD stands for screen resolution and broadcast content standard. The term 4K comes from the Digital Cinema Initiatives (DCI) consortium that standardizes production specifications and digital projection of 4K content. In the case of screens, Ultra HD marks the resolution used by televisions, monitors etc. UHD today includes 4k and 8k. True 4K has a resolution of 4096 x 2160 pixels, abbreviated 2160p. 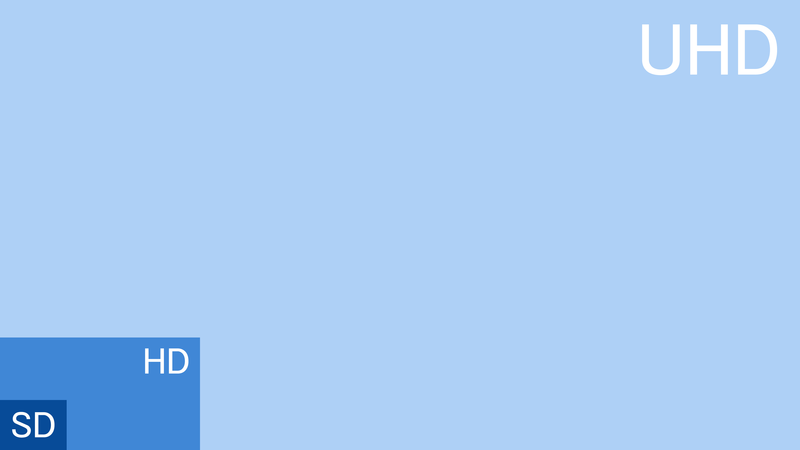 On the other hand, UHD is 3840 x 2160, also abbreviated 2160p. Although the image ratio of both 16: 9, 4K standards has slightly more pixels, and it is used for digital production and cinema. In cinematography, DCI 4K is the main standard for 4k broadcasting. 4K UHD or UHD-1 is the dominant standard in television industry. 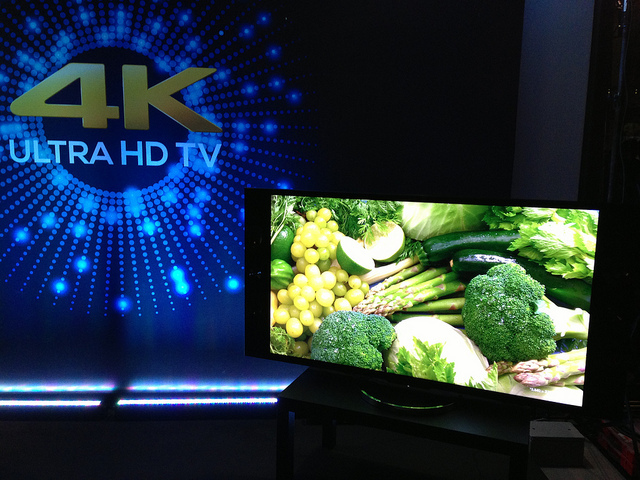 Ultra HD is used in television monitors, the real – cinema “4K” is used in projectors only. 4K means entirely different thing when talking about cinema or home projections. This resolution has been used in cinemas for some time, and it was due to the fact that for high-production films it was quite important to look good to every visitor in the cinema. The rule is that for obtaining the best picture one needs to sit at a distance of one and a half times the height of the screen, which is almost impossible considering the size of the cinema screen today. This problem was solved by the new standard – 4K Ultra HD resolution, and the same solution turned out applicable in our homes. The diagonal of TVs that we can buy is bigger, but our daily living spaces does not grow so we cannot move further from the TV. So one need larger screen to tell the difference between classical UHD and 4k. Although manufacturers often use these terms interchangeable and classify them in the same manner, this is a mistake. True 4K has a resolution of 4096 x 2160 pixels, abbreviated 2160p. On the other hand, UHD is 3840 x 2160, also abbreviated 2160p. Although the image ratio of both 16: 9, 4K standards has slightly more pixels and it is used for digital production and cinema. Emilija Angelovska. 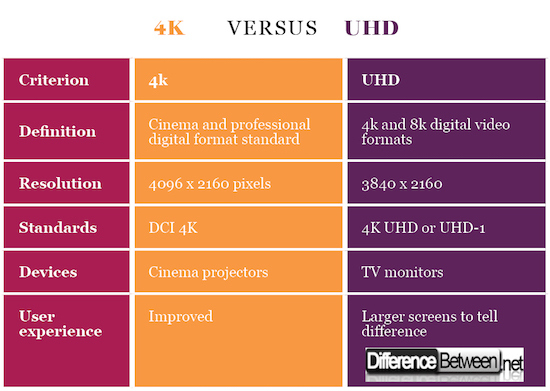 "Difference Between 4k and UHD." DifferenceBetween.net. April 2, 2018 < http://www.differencebetween.net/technology/difference-between-4k-and-uhd/ >.